HALF DAY - Our Most Popular Trip! 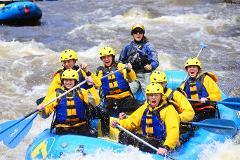 Class II, III, and IV Whitewater Rafting in Colorado One of the most action packed whitewater adventures in the state! HALF DAY - Our shorter, fast paced trip! Class II, III, and IV Whitewater Rafting in Colorado A great first time trip! FULL-DAY - Our Guides’ Favorite Trip! Class II, III, and IV Whitewater Rafting in Colorado A true full-day, very few whitewater adventures in Colorado can match this amount of whitewater! HALF DAY - Our Most Exciting Trip! 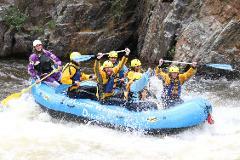 Class II, III, and IV Whitewater Rafting in Colorado Take the Plunge in the most adventurous craft in the fleet! The only overnight trip offered on the Cache la Poudre River. This trip offers guests the opportunity to experience the “Wild & Scenic” Upper Rustic section of the Poudre River while eating gourmet camp food and sleeping under the stars.